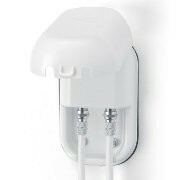 The Maxview Twin 'F' Type Weatherproof Socket provides a weatherproof cable entry point that is ideal for use with Sky Plus or Sky + HD Receivers in a caravan or motorhome. 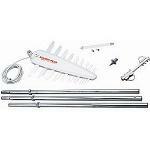 The Omnimax Pro is an omni-directional TV aerial designed for mobile and touring vehicles. With a refreshed look, the original Omnimax has been updated to give even better performance for digital TV reception. Our range of Directional Leisure TV Aerials offer uncompromised performance without the need for a permanent through-the-roof installation. The 14 Element Mobile TV Aerial is ideal for medium signal areas where a temporary mount solution is preferred. The Vision Plus Image 420 is a mast mounted caravan aerial, recieving both digital and terestrial signals. 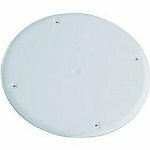 The Image 420 antenna gives complete UK TV reception and can be mounted to any mast with a 25mm tube diameter. The Vision Plus Image 430 is a mast mounted caravan aerial recieving both digital and terestrial signals. The Image 430 antenna receives UK TV signal as well as FM radio and VHF signals for europe wide digital and terestrial TV reception. Powerful wideband portable aerial for the outdoor leisure market in a package complete with 2 x universal mounting brackets and 4 section 3.5metre mast. Recieves both digital and analogue signals and adjust for horizontal and vertical waves. Flat coax cable for windows or doors for your motorhome or caravan.